(AP) -- Hackers broke into a Nasdaq service that handles confidential communications for some 300 corporations, the company said Saturday - the latest vulnerability exposed in the computer systems Wall Street depends on. The intrusions did not affect Nasdaq's stock trading systems and no customer data was compromised, Nasdaq OMX Group Inc. said. 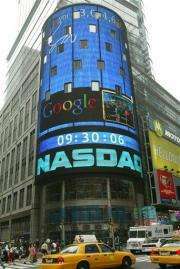 Nasdaq is the largest electronic securities trading market in the U.S., with more than 2,800 listed companies. DeMaria said Nasdaq OMX detected "suspicious files" during a regular security scan on U.S. servers unrelated to its trading systems and determined that Directors Desk was potentially affected. It pulled in forensic firms and federal law enforcement for an investigation. They found no evidence that customer information was accessed by hackers. Rich Mogull, an analyst and CEO with the security research firm Securosis, said Web-accessible services like Directors Desk are a prime target for hackers, and have sometimes been a back door for systems that aren't directly connected to the Web. The presence of files on the Directors Desk system and the claim that no customer information was compromised could indicate that hackers were able to get in but not complete their attack, he said. Computer security experts have long warned that many companies aren't doing enough to protect sensitive data, and recent events have underlined the point. The secret-spilling organization WikiLeaks has published confidential documents from banks in Switzerland and Iceland and claims to have incriminating documents from a major U.S. bank, possibly Bank of America. "We continue to evaluate and enhance our advanced security controls to respond to the ever increasing global cyber threat and continue to devote extensive resources to further secure our systems," he said. Some of the Wall Street's technological scares have been unrelated to hackers. In June 2009, a computer glitch knocked out trading in 242 stocks on the New York Stock Exchange for several hours. More recently, high-speed trading software precipitated a "flash crash" on May 6. One trade worth $4.1 billion touched off a chain of events that ended with 30 stocks listed in the S&P 500 index falling at least 10 percent within five minutes. The drop briefly wiped out $1 trillion in market value as some stocks traded as low as a penny. see you on wikileaks in a few months? Network centric war on boyos, recruit or die!